Whether it’s running, swimming , cycling or crossfit, athletes need to eat a nutritious, balanced diet to fuel the body. Good nutrition, like any workout, has some general rules and concepts. I don’t know about you but my body needs the energy before, during and after my fitness events. What diet is ideal for athletes? Athletes need a diet that provides enough energy in the form of carbohydrates and fats as well as essential protein, vitamins and minerals. This means a diet containing 55-60 percent of calories from carbohydrates (10 to 15 percent from sugars and the rest from starches), no more than 30 percent of calories from fat and the remaining (about 10-15 percent) from protein. That translates into eating a range of different foods every day – grains, vegetables, fruits, beans, lean meats, and low fat dairy products. The base of the diet should come from carbohydrates in the form of starches and sugars. Water is very important to prevent dehydration as dehydration can stop even the finest athlete from performing their absolute best. Are Carbohydrates Important for Athletes? When starches or sugars are eaten, the body changes them all to glucose, the only form of carbohydrate used directly by muscles for energy. Whether carbohydrates are in the form of starches (in vegetables and grains), sucrose (table sugar), fructose (found in fruits and juices) or lactose (milk sugar), carbohydrates are digested and ultimately changed to glucose. The body uses this glucose in the blood for energy. Most glucose is stored as glycogen in the liver and muscles. During exercise glycogen is broken down in the muscles and provides energy. Usually there is enough glycogen in muscles to provide fuel for 90-120 minutes of exercise. Most exercise and sport games do not use up glycogen stores so eating carbohydrates during the activity usually isn’t needed. But for some athletes, eating or drinking carbohydrates during exercise helps maintain their blood glucose and energy levels. Most athletes need not be concerned with “carbohydrate loading,” the special technique of eating a lot of carbohydrates for several days before an endurance event (Im sure you all have heard about it) :). Instead, focus on getting enough carbohydrates everyday. The best way to ensure plenty of energy for exercise is to eat a nutritious, balanced diet that is high in carbohydrates and low in fat with lots of different foods. Do athletes need extra protein or protein supplements to build muscles? No. Muscles develop from training and exercise. A certain amount of protein is needed to help build the muscles but a nutritious, balanced diet that includes two or three servings from the meat/bean/egg group (6-7 ounces total) and two to three servings of dairy daily will supply all of the protein that the muscles need. Extra servings of protein in foods or protein supplements do not assist in muscle development. Unlike carbohydrates, protein cannot be stored in the body and any excess will be burned for energy or stored as body fat. What should an athlete eat before, during and after exercise? researchers have found that eating something from 1 to 4 hours before exercise helps keep plenty of blood glucose available for working muscles. It is also critical to drink plenty of cool water before exercise to keep muscles hydrated. Perspiration and exertion deplete the body of fluids necessary for an optimal performance and lead to dehydration. It is important to drink plenty of cool water, at least a half a cup of water every 20 minutes of exercise. Usually there is no need to worry about replacing carbohydrates unless the exercise lasts over 90 minutes and is hard and continuous. When this happens, drinking a sports drink or other beverage with some sugar in it will fuel and water to the muscles being exercised. If the exercise was strenuous and lasted a while, glycogen stores may need refueling. Consuming foods and beverages high in carbohydrates right after exercise will replenish glycogen stores if they are low after exercising. No matter the intensity of the exercise, it’s important to drink plenty of water and eat a nutritious, balanced meal that has lots of carbohydrate rich foods such as grains, pastas, potatoes,vegetables and fruits. Thanks for your blog. I’m still off sweets and raw sugar type foods. Thanks for the challenge. It’s working. WOW! Thats awesome. This Friday the 24th is the last day of the challenge. Seems like forever, I am glad that you are still on board. I’ve got a ways longer to go than you. I started late. Looking good. Glad to see the effort you have put into it. Thanks a bunch! Hope you enjoyed reading!! 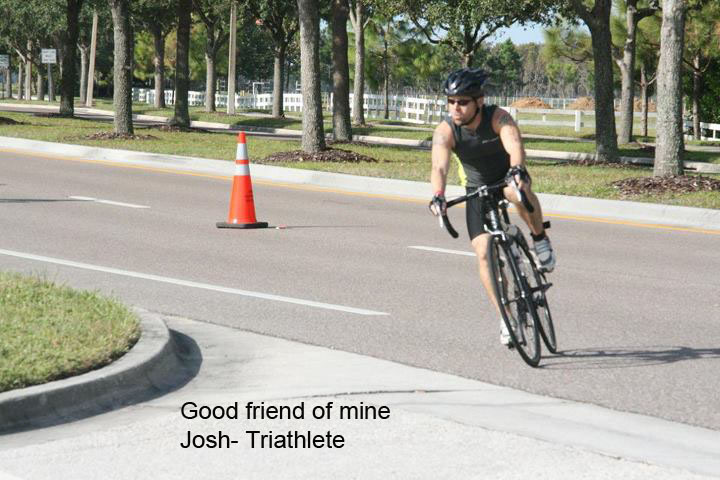 My husband is training for his first Iron Man right now. This post is just what he needs to read as he increases his endurance and strength. Great post! Thank you. I’m glad that you will share this post with him! Good luck to him and all the best on the Ironman!! Thanks for stopping by our site! We are excited that another fitness fan is interested in our work and we would love to build a relationship with you in the future! Great article, easily summing up the needs for athletes everywhere, we will definitely continue stopping by for inspiration. Thank you ! I am glad that you all liked the post! I figure If I can stay surrounded around as many fit and healthy people as possible the more I will stay motivated. I def get my energy from people. Great post! This is one of the top questions I get from my boot campers…what to eat and when. Thanks for posting! Awesome! Glad to be of help. What type of bootcamp classes do you teach? Great post! Also thank you for stopping by and following. THANKS ALOT! I’ve been doing the WRONG thing! I usually eat a protein bar before exercise and then an EAS carb control ‘shake’ after workouts. eegad! Thank you for the post. i tend to neglect the water component. Its ok! Just try and focus on drinking a few extra ounces each day. Make your water fun, add lemon, limes or even cucumbers. Great post, and you have a very thorough blog here. I look forward to your future posts! nutrition is important for everyone when they understand the health sciences and nutrition, especially for athletes, I agree with your post. great blog. I found it really interesting and useful. Thanks Alot! Im glad that you liked it. Good article! Does this mean you’re a vegetarian? That’s great! It’s always awesome to see an athlete denounce the need for meat in the diet. Too many people think they have to eat animals “to get their protein”, and it really makes me happy to see more and more athletes moving toward a vegetarian lifestyle. Maybe it’ll catch on and be the norm one day! Actually part vegan except for cheese. I have cheese every so often. If I could cut it out I would be vegan. I’m working on it though!! i admire athletes because working out doesn’t feel good! I’ve enjoyed several of your posts. I’m also about 98% vegan. I still have cheese occasionally, but nothing else. If you haven’t already read Thrive by Brendan Brazier, it’s a great book for vegan athletes. Forks Over Knives and The China Study are also great. NoMeatAthlete is a great website also. Keep us posted. Thank you! I am glad you like the post. Yes I love cheese as well. I have reduced my intake big time but I occasionally have it. Thank you for book suggestions, I will check them out.